With a new player sitting at #1, where will the pig sit and who else makes Cal’s top 10 this week? Can anyone stop Jack Marcae? I’ll answer that… NO. For the first time this year, he sits as the #1 man based on form averaging 132 in his last three games off the back of 151 and 145. This week, he’ll continue that against the Lions under the Etihad roof. Last week, Collingwood scored 7×100+ scores on the Lions and so far this year, they have given up a truckload of points, which have included 5×120+ scores. In fact, they have given up the most 100+ scores this year. Macrae scored 126 and 95 against these guys last year, but the deciding factor here is not only that he’ll run free without a tag once again, but at Etihad this year he has averaged 131 from his 4 games. Honestly, can anyone see him not scoring 130+ again? I certainly can’t… I just wish I had him. 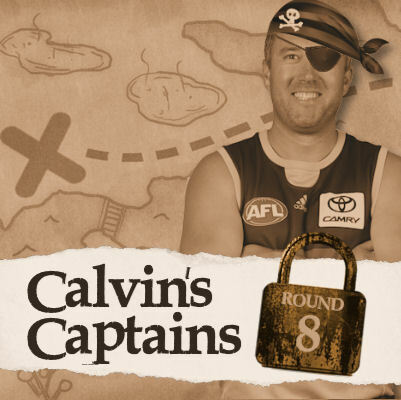 FACT: If you had Jack captain over Titch for the last four weeks… you’d be 91pts better off. Geelong = 3rd easiest team for midfielders to score on and 3rd easiest overall so far in 2018. They rank 4th in the most 100+ scores given up. Collingwood = #1 for midfielders to score on and 3rd for the most 120+ score conceded… and they even played Zorko (176) and Beams (120) back in form last week when we all thought they were done and dusted. The concern is he is playing forward, but I think Patrick Dangerfield will cash in on the Pies this week, just like many guns have this year. He sat forward 54% of the game last weekend and 77% forward in the final term. With that said, he still managed 27 touches and his 2.2 goals. Collingwood even allowed Beams (120) and Zorko (176) to beast-up last week. Before that, the best scorers were the pig (156) Marc Murphy (139). Let’s face it… they give up sh*tloads. He scored 126 and 76 on Collingwood last year and I think this week, he could be nasty. Gary Ablett will return here and offer an instant reward to Draft owners. He nearly played last week and like many, he loves playing the Pies with score of 152, 67 (inj), 163 and 190 in his last four. OINK. Mitch Duncan scored 115 last weekend and 105 before that, after a slow start to the year, he is slowly warming up and this is the kind of game he will dominate. He loves playing the Pies and has scored 117, 117, 122, 137 and 105 in his last 5 against them. If that’s not top 5 material, I’m not doing my job. This won’t be a one-sided scoring fest, and here I was thinking that Adam Treloar would cash in as well. He sits with an average of 123 in his last 3 (ranked 3rd) but does Scooter Selwood go with him here? I’m tipping YES. Pendlebury missed the last quarter last week and will be doubt, and although I think he’ll play, Scooter could really hurt Treloar owners this week (like me) which certainly doesn’t make him captain material. If Pendles does get up, he has a strong record here with 141, 114, 142 and 121 on the Cats in his last 4. “Strong record?” who am I kidding, those numbers are just nuts. For the third time since getting disrespected and subsequently traded to the Hawks, Tom Mitchell this week faces off against his old coach Horse Longmire. Last year when they met, if you were keeping score, you’d say that Horse beat the pig on both occasions. Mitchell scored 94 and 108 in those two games and those scores were his worst and third worst scores for the year. Amazing! Now, Sydney are back to being a hard team to score against and they have only allowed 10 tons to midfielders (1.4 per game) so far this year. They have also only allowed two midfielders (Macrae and Wines) to score over 120. Last year when he was ‘below-par’ for pig standards, there were no tags. Add to this, Sydney have ran with taggers this year, but I can’t see one coming in this one. In summary… He has scored 119 and 147 in recent weeks, and plays this week on the MCG against a team who he struggled against last year but they didn’t tag. I’m not too concerned here, he will still be solid as and should post us something around the 120-130, hopefully by three quarter time… but he does come with some element of risk. WEATHER ALERT: Apparently, it will be absolutely bucketing down for this game. Awesome! The pig hasn’t been taking the mark to bump up his score and he’ll have 15 tackles. Don’t let the wet weather put you off, he’ll be like a pig in mud. Although, Dusty Martin scored 93 last week he saved himself with a 34pt final term and hasn’t looked like he did last year. He only has 1×120+ score next to his name and this week, he could come up against the best tagger in the game, Ben Jacobs (good luck Ben). Dusty did score a monster 164 last year on the Roos and last week when Jacobs ran with JPK (122), Kennedy was the first person this year to ton-up against the leagues No.1 tagger. Can Dusty bounce back? The odds are against him but his history on the Roos suggest he’ll be huge. QUICK AS YOU CAN CALVIN…. Patrick Cripps v Essendon @ the MCG: No tag coming again for Cripper and he scored 95 and 110 in his most recent against the Bombers. Josh P. Kennedy v Hawthorn @ the MCG: 47 and 112 on the Hawks last year and has 9 tons in 12 games before that. This is his favourite team to play and he will continue his form that has seen him score 122 and 111 in his last two games. Nat Fyfe v St Kilda @ Etihad Stadium: 128 last week and the #4 man in the game at the moment based on form. Hates playing the Saints with just 1×100+ against them in his career 6 games. Bryce Gibbs v Port Adelaide @ Adelaide Oval: 100 and 102 are his last two scores. Solid, but not captain material at the moment. Stephen Coniglio v West Coast @ SPO: Neale (138) and Cripps (138) are the two best midfielder score on the Eagles this year and he scored 121, 97 and 121 in his last three against them. Could be awesome at home. Jack Redden v GWS @ SPO: He was cheap at the start of the year and now you can buy him for $19K less. After scores of 138 and 124, he’s not captain worthy but even Roy would agree… a trade target who is in hot form. But this is his turf. I better step off. Zach Merrett v Carlton @ the MCG: Look out here comes Curnow! Zach scored 96 and 97 in his last two games against the Blues and should be tagged here after scoring just 64 last week thanks to yet another tag .. this time from Cousins (of all people). Andrew Gaff v GWS @ SPO: 110 and 120 in his last two games but only managed 99 and 63 in his last two on the Giants. Max Gawn v Gold Coast @ the GABBA: Witts’ hasn’t had a ton scored against him this year, despite Stef (99) coming very close. Max has been awesome and holds a score of 111 as his lowest in the last 5 weeks. He didn’t play these guys in 2017 but did score 106 (V Currie) and 138 (V Nichols) in 2016. Brad Ebert v Adelaide @ Adelaide Oval: 92, 137 and 126 are his last 3 games, and he scored 83 and 104 in the Showdowns last year. Dayne Zorko v Bulldogs @ Etihad Stadium: 176 last week was nuts but it was against the Pies. His three games before that didn’t even equal 176 (43+55+63=161) but he loves it at Etihad and scored 94 and 157 on the Dogs last year. I think he’s back! Lachie Neale v St Kilda @ Etihad Stadium: Unlike Fyfe, he loves the Saints and has scored 117, 104 and 112 in his last three. Rory Laird v Port Adelaide @ Adelaide Oval: Port are the hardest team for small defenders to score on. Coming off scores of 100 and 111, you’d think he’d be fine though, as he even had 109 and 92 on Port last year. Am i crazy to put the C on Mclean? He’s been locked in all my teams all week. Coming off 130 against Grundy, up against a ruckless Doggies team, it’s a guaranteed ton… and hopefully then some! He’s sharing ruck duties though with McInerney. Also the dogs surprisingly haven’t been giving up big points to opposition rucks. hawkins out this week, and you still think danger will go large ? Good luck if you have Macrae. Too expensive for me at the moment. Stefan Martin vs Bulldogs? Will dominate vs English/Trengove/Boyd. Rucks against the Dogs have not gone as well as I would’ve thought (see below), but none of them are Stef. I would think he’d be good for at least 110. Docklands not his favourite hunting ground (averages 14 less than at the Gabba). Why not Ed Curnow not even get a mention? Yeah I kind of thought stef Martin would be a chance to go huge this week against a cast member from diary of a wimpy kid. Bug I’ll have to do some maths and get back to us all. 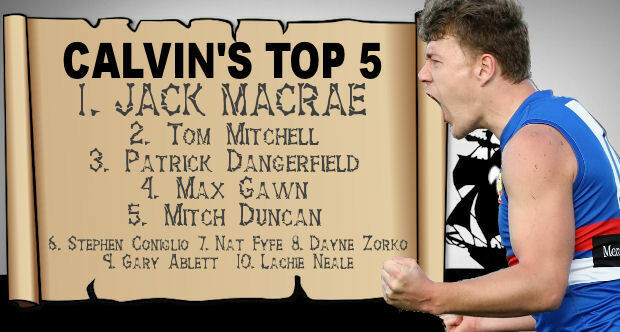 Can you get Macrae any other way? Which option would you do? Parker is vsing Hawks this weekend who are easy to score against. I’d go option 2. Get in a fwd keeper & pray that Parker comes good! Worth trading Parker if it means I can grab Macrae? Hey Warnie what sort of woose are you .You’ve got this Ned Kelly/Hawk wakka trolling this site / you do nothing /weak as your fanasty game. Macrae was a steal @ 750k. I’m putting the C on macrae again. Why not. The last 2 weeks I’ve had as captain. He’s killed it. Make it 3 in a row lol……..LMAO with the teams, couple of people who were somehow defending English, we’re are you now?. Oh that’s right. Pressing the trade button on him hahahaha. well, the first part is true, thats for sure. Listen cowboy , your not fooling anyone around here. Enough is enough, we all know hawk/Ned kelly is same guy can tel by the writing and grammar is as pathetic as a five year old. Just give it up and start using this site like it’s suppose to be, please for the rest of our sake. And the fact they comment pretty much directly after each other is a giveaway.